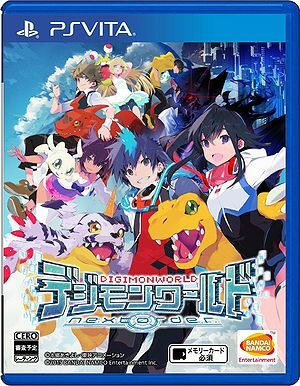 Digimon World -next 0rder- (デジモンワールド －ｎｅｘｔ　０ｒｄｅｒ－, Dejimon Wārudo -Nekusuto Ōdā-), stylized as Digimon World -next Ørder-, is a video game. See Gallery:Digimon World -next 0rder-. According to Famitsu the game sold 50,251 copies and landed on 2nd place during it's first week in Japan. The game sold through 60%-80% of it's stock. During the second week the game sold 10,687 copies and landed on the 13th place still estimating to sell through 60-80% of it's stock. During the third week the game sold 4,414 copies and landed on the 18th place still estimating to sell through 60-80% of it's stock. During the fourth week the game sold 2,607 copies and landed on the 22nd place but from this point on it is estimating to sell through 80-100% of it's stock. During the fifth week the game sold 1,710 copies and landed on the 29th place. The game left the Famitsu charts on the sixth week. ↑ 1.00 1.01 1.02 1.03 1.04 1.05 1.06 1.07 1.08 1.09 1.10 1.11 1.12 1.13 These Digimon are referred to as Ultimate Digimon with the level written in yellow. They are only available through the Jogress of two Ultimate level Digimon, or feeding normal Ultimate level Digimon an evolution crystal. These Digimon cannot be fed these same crystals. They also are incapable of Extra Cross Evolution (EXE). This page was last modified on 5 February 2019, at 01:06.